There is always something different that catches your eye, which is unfortunate sometimes. We seem to narrow our horizons and tend to stick to things we know. Sometimes, it is good to widen our perspectives, especially in this vast car world we’re all in. It is always fascinating to see what other car cultures are doing. The Russians do have quite a crazy and diverse style; from their insane drift builds and drivers who give the Japanese a run for their money, to full-on show-built cars. Their culture is interesting, seeming to take styling cues from all over the world and putting them into one place. Maybe with the sheer size of their country, you can see why. The Lada Scene / John Ludwick. One style, which does have quite a following is the Lada scene. This boxy, small and basic car has become loved worldwide and here we have one Lada that has had quite the journey over its years of existence. From Russia to Lithuania, exported into Kettering and next to Wales. A trip on a boat into New Hampshire and a final journey of building to get down to Ocean City USA. But first, we start this story on home soil, here in England. Earlier last year John Ludwick Jr had planned a trip over the pond, much like my friend Alex did back in 2015. Basically to hit as many European countries in one trip and see as many friends and online friends as possible. The main reason was to attend Worthersee. For John, and his friend Corey this started by leaving Boston, a quick stop off in Iceland and touching down in Manchester where a certain Si Gray was waiting to pick them up and give them his hospitality in ‘The North’. I first met John on Tinder, isn’t that how most friendships are started nowadays? (EDIT* Oh Dan you are funny) On my first trip over to the States back in 2016, we met in person at what was a very short Governors Club meet in Ocean City, grabbing a tee, obligatory H2Oi key ring and seeing the fantastic Corvair, which I did happen to shoot last year, but that’s for another day, another post and less procrastination. It was great to finally meet in person. So with John coming all this way and myself taking a break from the long trip to Velden, I thought it wouldn’t hurt to travel the five odd hours north and stay with him and Corey at Si’s house. It was great to catch up once again. It really is amazing how this metal object on four wheels can connect us to people all over the world. This first day is where this story begins, late that evening, chilling whilst half-heartedly watching movies, instead of catching up & talking cars, we wandered onto the subject of dream cars. You know, that car(s) you’ve always want to own, but never actually made it happen. Well, we found out that one of Ludwick's was a Lada, a 2101, or 2102 Wagon to be precise. Well, what happens when you think about these dream cars? You go on the internet and find them for sale and become sad that there is probably no way you’ll make it happen. For Ludwick, he nearly had the same fate. Upon finding an orange late model 2101 on Classic Cars his head popped up from his phone, he asked: “how far is Kettering?” not that far in fact! At first, this whole ordeal did feel a tad fairytale and a few what if’s, like "could he actually afford to buy a car whilst on holiday? How would he even get it home? Who would be able to even help transport it in the UK?" We hadn’t really gone anywhere with the idea. You can see why these cars slip away. After more thought and many hypothetical questions later at around 10pm Ludwick bit the bullet and called the guy. The dream was pretty much crushed when upon a few exchanged words the guy said: “oh I sold that a day ago” To that, John and the rest of us thought this eventful evening of discussion was over until the words “But I do have another one in Red, I can message or e-mail over some photos if you like?” And so he did. Ludwick had mentioned a Red one was more what he was after but this technically isn't a Lada, but a Zhiguli... still the same thing right? So we agreed that a trip to Kettering, to view a car whilst on holiday wasn’t such a crazy idea and we made the final commitment to do so. I did have one slight issue mind, does a GT86 sit 3 people comfortable for a good five-hour round trip? Well if you have Corey in the back behind the passenger seat pulled all the way forward, yes, yes it does! We headed to bed ready for the pilgrimage the following day. One Large Starbucks = '72 Zhiguli 2101. Up early and a quick food stop at Sainsbury’s including a fry up, we were ready to go. Si actually had a guy who funnily enough was coming up from Essex just like me for a PVW shoot. We left him at the house to work his photography magic and we headed down to Kettering. Easy drive, just one stop for a large Starbucks and we arrived at the seller's house. Sometimes you have that feeling when you think you’re at the right place but not 100% sure? Well, we didn’t have that. With two Ladas parked in the driveway, we knew we were in the right place. A short trip down the road we came to a set of garages where the seller opened one, jokingly saying: “I hope it starts” to which it did, without a missing a beat and reversed it out of the garage. I’ve never seen one before in the flesh, I’ve seen them on forums, Stanceworks, mainly back in the day. They’re not as small as I had imagined but still as cool even in standard form. She was a beauty. A few age related marks here and there, but what do you expect from a car that’s already traveled thousands of miles from the Soviet. After some negotiations and chatter, Ludwick and the seller agreed on a price and the car was paid for there and then, with the most hilarious exchanging of documents I’ve seen to date. We really weren’t sure the what looked like a homemade laminated A5 bit of yellow paper was real or not but we took the guy's word and got ready to head off. Back into the same garage, the Lada pulled into to await whatever way it would travel another few thousand miles to the East Coast of America. We got back on the road, and John made arrangements with his friend Dean @dean.flowers who could pick the car up and get it to the docks for shipping. What a surreal set of circumstances. In the space of 24hrs, we’d gone from joking about those dream cars to Ludwick actually making it happen. I thought my trips to America were expensive, well I can say not so as I haven’t bought a car over there... Yet. The next day it was time for me to say my goodbyes to Ludwick, Corey, and Si and head back down south where I would later regret not doing Worthersee this year whilst seeing how much fun John and Corey were having. And so the story continued. ...I’d see the Lada one more time! 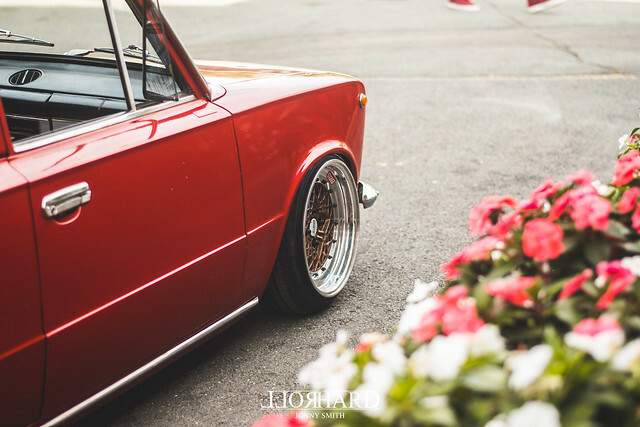 While in Worthersee, before Ludwick had even got the Lada out of the seller's garage, he had other Lada owners from Russia and Ukraine offering to help with the build, either knowing of places to buy niche bits or to sell parts they had themselves. This resulted in some new old USSR stock making their way to him. A new front grill badge and rear light lenses which the guy even polished to as he wasn’t happy with the condition they were in after being in storage. Incredible how connected and helpful people are. Cutting Springs With An AK47. Not long after returning back home himself, the Lada followed and work started straight away. His deadline was the unofficial H20i gathering, like normal, in Ocean City MD. Not a huge amount was in order, you could say air and wheels but mostly everything had to be custom made so this wasn’t the easiest build. I guess just chopping the springs with an AK47 wasn’t exactly what Ludwick had in mind. With the custom bag set up making good headway, a wheel choice was next inline. Using the 3 piece 14” Epsilons he had lying around they were stripped, re-painted and re-built. Once all together, along with the custom engraved turbo fans and center caps, Ludwick had produced himself a car he had always wanted to build and own. After some time, he came to the conclusion that even though the Epsilons did look amazing, 15’s would look more at home. So the hunt for a new set of wheels began and this ended with what you see now. A wonderful set of BBS Motorsport E76s perfect in 4x100. Well, I promised you I would see the car again. I headed back to the States for the third year. This was more of a social trip than for cars, unlike the two years prior but I made sure I was out the for Staggered Show, held not too far from where I was staying and Ludwick's house; the perfect place for a reunion. 6 months later and this wonderful Lada had made quite the transformation and quite the journey and I feel proud to have played a small part in it. Sometimes you just have to do the spur of the moment and sometimes it works out. Upon writing Ludwick has sold on the Lada In his own words of owning too many cars he had to let it go and concentrate on other projects he has. A short but sweet time together but one thing he can tick off his list and say he’s done with a smile on his face. Maybe he’ll make a start on the BMW 700, or the 1952 5 window COE truck/flatbed and then I’ll have an extra excuse to fly over the Atlantic once again. ...and in other words, it's the journey that makes us.